BYO Coffin or Casket ? Of course you could ! A research study on death care and the funeral industry in Australia was released by The University of Sydney, Business School. We read with intent on what Professor Sandra van der Laan might uncover. In her own words, this industry is “shrouded in secrecy”. But it takes much persistence and courage to open such a Pandora’s Box. We, in the know, applaud Professor for taking this topic at the reigns, and giving it a good shake. And indeed, the research has raised a lot of interests and alarm bells, due to the lack of transparency. Families are unaware of the choices, let alone their rights at time of need. Consumer choice and bringing change to the industry — that is our vision. We have been working for some time to try and offer transparency to the general public. It’s not been an easy journey for us. We’ve even been perceived as market disruptors by Funeral Directors. When we started collaborating with Costco to provide a select range of coffins and caskets to the general public last year, our contact number was no doubt deleted off many Funeral Directors’ phone list. But in support of Costco’s mission to provide the retail market a just and fair coffin product and price, without jeopardising on quality, we needed to take this step. Thankfully, some Funeral Directors are genuine in their approach, and are all in with their support to bring change and transparency to this traditional industry with us. How we manage this kind of a relationship is to provide a select range to Costco, and reserving exclusive items to our Funeral Directors. This arrangement provides a choice to the consumer; whether they choose to buy a coffin from the retail market or choose one from the Funeral Director. At least that’s fair. There is no regulation for the Funeral Director to deny you your right to source a coffin that is not of their own; nor is there one to stop them from doing so. 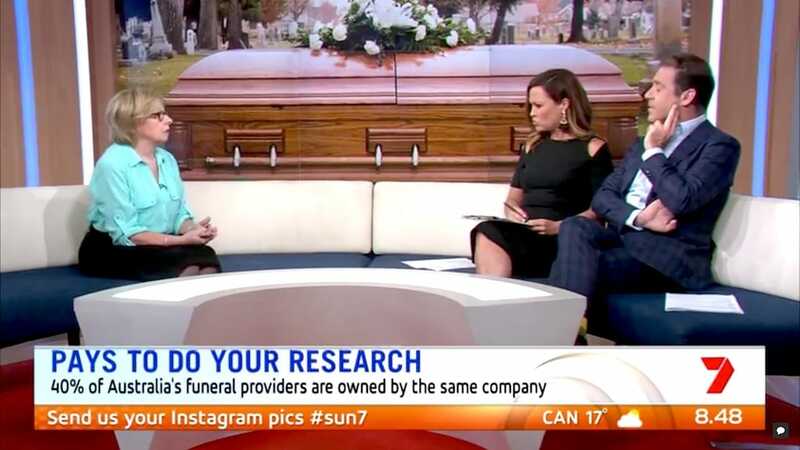 In light of this, Dale Maroney, Senior VP of Australian Funeral Directors Association appeared on Channel 7 Sunrise to comment on the topic of inflating funeral prices. The broadcasters highlighted that funeral homes have ‘packages’ where the consumer don’t even know what they’re paying for. More importantly, this question was put to Maroney — whether consumers are free to ‘pick and choose’ funeral service products from bundled packages, such as flowers, cars or coffins — Maroney’s answer was “of course you could”. At last! A representative figure has spoken out. Maroney encourages people to shop around, do their research and to sit with their Funeral Director to go through the itemised bill, because the cost of a funeral service all comes down to choice. There is certainly more to be done so that a regulated system is in place to protect consumers from the mysteries of the funeral market. But at least folks, you’re now in the know — it pays to do your research, and a responsible Funeral Director will provide an honest and professional service with a family’s need close to heart. Newer Post Remembering Dad on Father’s Day Older Post Funeral Planners or Wedding Planners ?